Extra storage is always good to have in a home. We have a good sized walk-in closet in the bedroom enough for two people but the space can become a little tight at times. So to free up some space for the closet, I needed an additional storage that have good capacity and has the same aesthetic design that matches our bedroom. 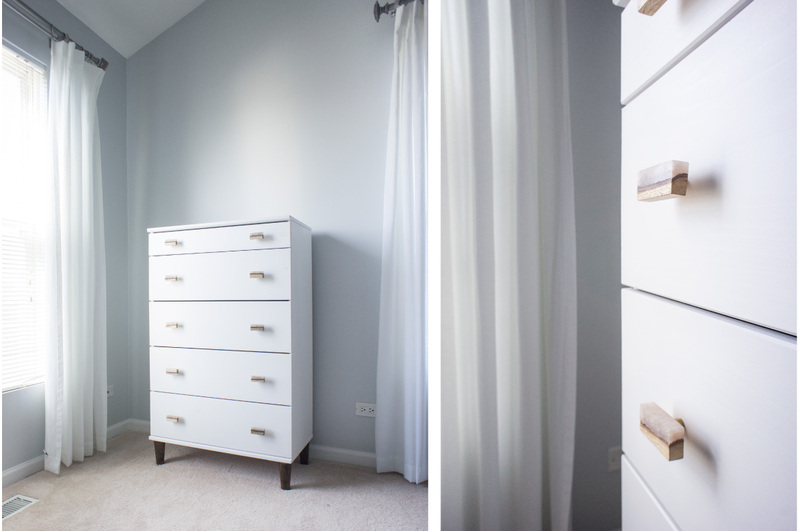 The idea that I had for the bedroom was to incorporate a mid-century modern style with the clean simplicity of Scandinavian design. 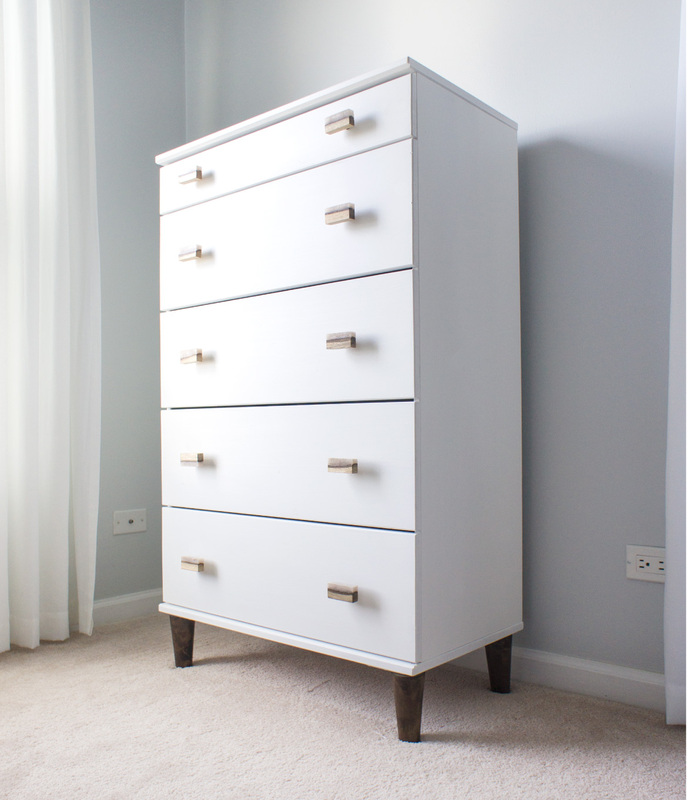 Most of the drawers I found in stores or online are either too expensive, not the style I like, or with dimensions that does not work for the size I need. To store things like socks, gym clothes, bags, and other items, a drawer that is sturdy, slender, and streamlined is what I need. 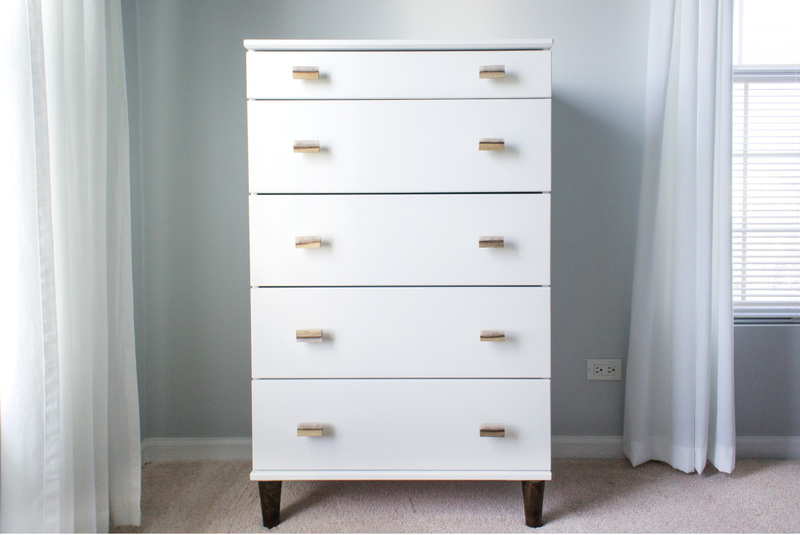 And of course Ikea have it – Tarva chest with five drawers, well-built, clean-lined, and a good price point. 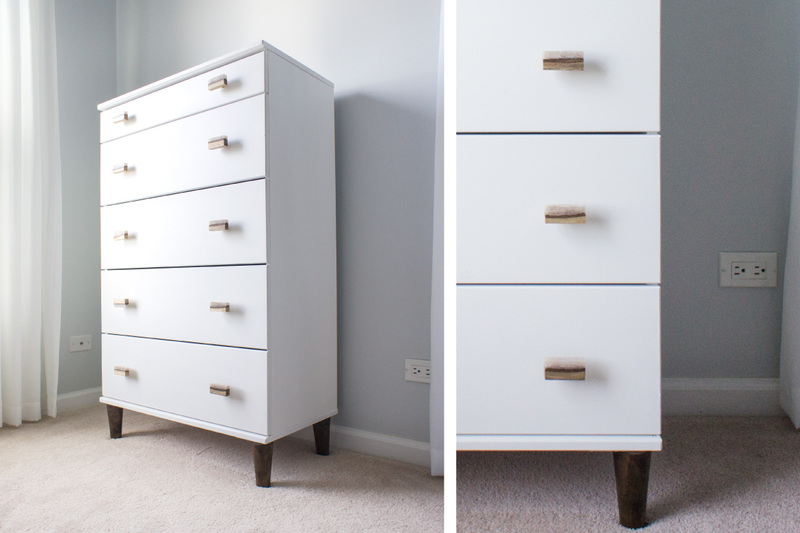 The nice thing about this chest is that it is ready for a DIY project. The possibility to create a one of a kind piece for your home is endless. 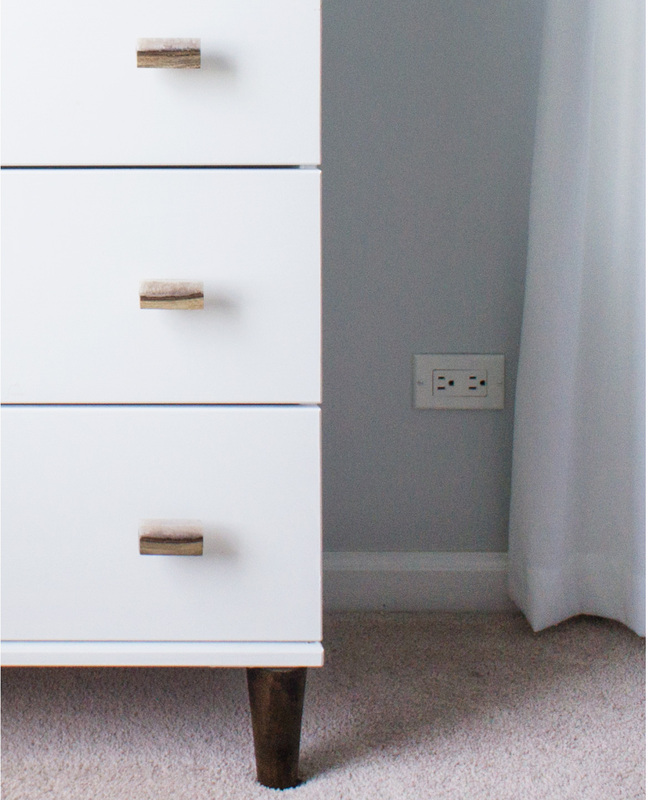 It can be painted or stained to any colors, the drawer knobs can be easily replaced, and the legs can be cut down or changed to create a different look and feel. The Tarva chest came in two boxes; one box contained all the pieces for the main body and the other box contained all the drawers. We separated the boxes in 2 different areas so the pieces will not mix up. We started off the project by lightly sanding the woods. Then primed the pieces with Kilz ( a guy from Home Depot recommended this brand, I think it works great!). I already have left over paint that can be used for the drawer. After the primer dried, I spray painted the wood pieces in white color. I have never tried to spray paint a furniture before and I tried it for the first time with a HomePro sprayer from Amazon. I found some pros and cons about spray painting a furniture. The pro is that it is fast and I like the end finish. The con is that I needed a good space and area to spray. I had to set up the garage to work in. To make area for spraying, we bought a big plastic covering and clipped it to our garage rails. To get the mid-century modern look, I replaced the original square feet legs with a tapered style furniture feet (the legs are from Etsy). I used Minwax/Wood finish in Jacobean 2750 color. It’s a dark rich brown color. This is my first time applying stain on wood and right away I made a mistake 🙁 . I put too much on the first leg and it turned out too dark (see the one on the right). Oh well, the dark leg will be on the back of the chest:) After that, we sprayed Minwax clear protective to finish the legs and let them dry. Here, all the wood pieces are dried and ready to assemble. To save our backs from heavy lifting to our second floor room, we assembled all five drawers downstairs because it is light. And then carried them piece by piece to the bedroom. I bought these knobs from Anthropologie. They have a wide selection of beautiful and unique knobs. I really like this knob style because of the rectangular shape that complimented the clean lines of the chest. The wood elements of the knob gives a warm and natural feel to the overall look. Also, the knobs have a lighter tone giving a nice contrast to the darker tone of the wooden legs. The screw that attached to the back of the knob is very long so we cut it to the right length. We marked them and cut it with hand saw. The red dotted line is where the tapered feet would go. 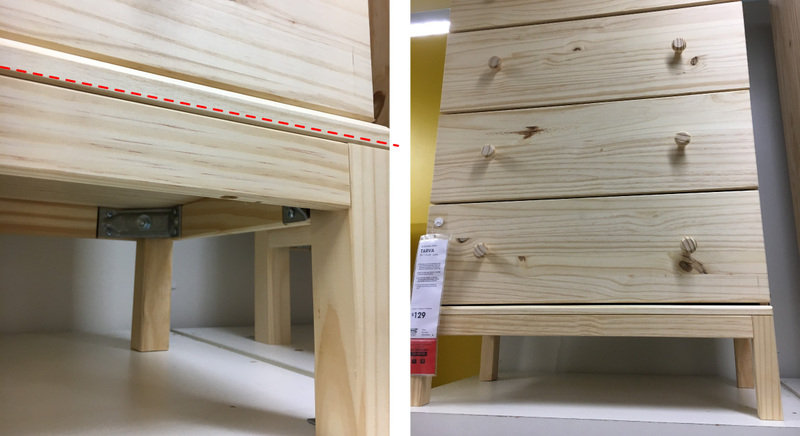 The screw that attached with the tapered leg is too long that it hits the base of bottom drawer. We also had to cut that extra length off. 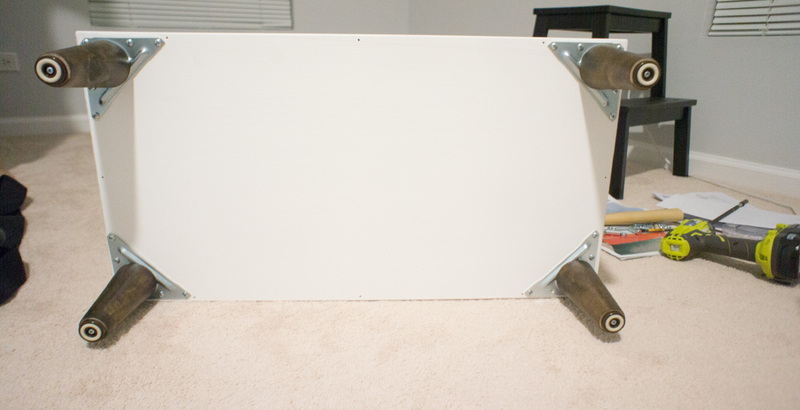 In addition, I purchased a triangle metal plate that would secure the leg onto the base. Before we attached the legs to the chest. We also added furniture feet floor protectors. As shown in the photo, we pre-drilled bottom base of the drawer again for the custom legs. 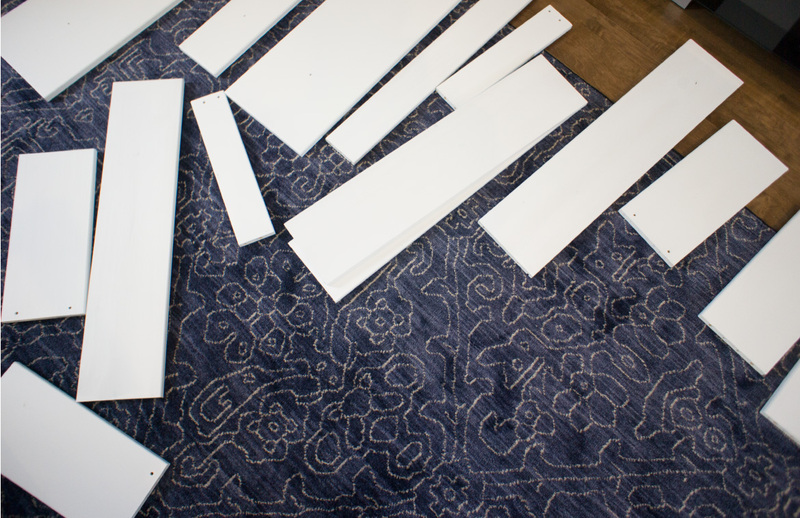 Note that the Ikea drawer had its own pre-drilled holes that does not fit the custom legs we purchased separately. Hence the multiple holes you see in the image. We then just screwed the triangle plates onto the wood. This is how the bottom of the drawer looked like before we stood it up. The chest fits onto the space nicely. It is large enough to store a lot of items. I can’t wait to add some flowers and books to the top of this chest. There are still more to come from the bedroom. But as of right now, I can cross this one out of my to-do list.